The study was conducted to evaluate nutrition status in mulberries sampled from 16 orchards to represent the study area in Upper Çoruh Valley. Soil samples were taken from different depths of soil such as 0-30 cm, 30-60 cm and 60-90 cm. Mineral content of soil and leaf samples from mulberry orchard were analysed. Available soil minerals of the orchards were found to be adequate levels in the study area. Mineral content of leaf samples were determined between 25.75 and 58.48 mg kg-1 for manganese, 13.53 and 41.15 mg kg-1 for zinc, 6.55 and 15.22 mg kg-1 for copper, 87.21 and 152.49 mg kg-1 for iron, 0.18 and 0.46% for phosphorus, 2.54 and 5.25% for nitrogen, 0.40 and 0.77% for magnesium, 1.36 and 2.90% for calcium and 1.58% and 2.79% for potassium. As a result, there were no found mineral deficiency in soil and leaf samples of mulberry orchard grown dried consuming as well as prepared as local specialties such as pekmez, pestil in the study area. Bu çalışma dut bahçelerinde beslenme durumunun belirlenmesi amacı ile Yukarı Çoruh Vadisi’nde Erzurum’un İspir ve Pazaryolu ilçelerinde yöreyi temsil edecek şekilde örneklenen 16 adet dut (Morus alba L.) bahçesinde yürütülmüştür. Dut bahçelerine ait toprak ve yaprak örneklerinde mineral içerikler belirlenmiştir. Toprak örnekleri 0-30; 30-60; 60-90 cm derinlikte alınmış ve her derinlik için ayrı analiz edilmiştir. Toprağın elverişli besin elementlerinde eksikliğin olmadığı saptanmıştır. Diğer taraftan dut yapraklarının mangan içeriği; 25.75-58.48 mg/kg, çinko; 13.53-41.15 mg/kg, bakır; 6.55-15.22 mg/kg, demir; 87.21-152.49 mg/kg, fosfor; %0.18-0.46, azot; %2.54-5.25, magnezyum; %0.40-0.77, kalsiyum; %1.36-2.90 ve potasyum ; %1.58-2.79 değerleri arasında değişim göstermiştir. Yapılan bu çalışma ile yörede önemli ölçüde pekmez, pestil ve kuru dut üretimine yönelik olarak yapılan yetiştiricilik kapsamında genel anlamda dut bahçelerinde besin elementi eksikliğine rastlanmadığı ve dut bahçelerinin beslenme düzeylerinin sınır değerlerin üzerinde olduğu tespit edilmiştir. Ajouri A, Asgedom H, Becker M (2004). Seed priming enhances germination and seedling growth of barley under conditions of P and Zn deficiency. Journal of Plant Nutrition and Soil Science, 167: 630-636. Anon (1954). US Salinity Lab. Staff. Anon (1997). California Rare Fruit Growers. Inc.. http://www.crfg.org/index.html. (Erişim tarihi: 5 Aralık, 2016). Aydın A, Sezen Y (1995). Toprak Kimyası Laboratuar Kitabı. Atatürk Üniversitesi Ziraat Fakültesi Ders Yay. No: 174. 145 s. Erzurum. Bajwa G A, Khan MA (2015). Management of macro- and micro nutrients in soil and mulberry foliage in Peshawar, Pakistan. Sarhad Journal of Agriculture, 31(3): 151-158. Bayraklı F (1987). Toprak ve Bitki Analizleri 19 Mayıs Üni. Yayınları. Yayın No; 17. Samsun. Brady NC (1984). The Nature and Properties of Soils. Macmillan Publishing Inc. New York, USA. Florea T (2003). The study of manganese content in soil, wheat grain and wheat plants. Ovidius University Annals of Chemistry, 2003; 14(1): 9-11. Ercisli S (2004). 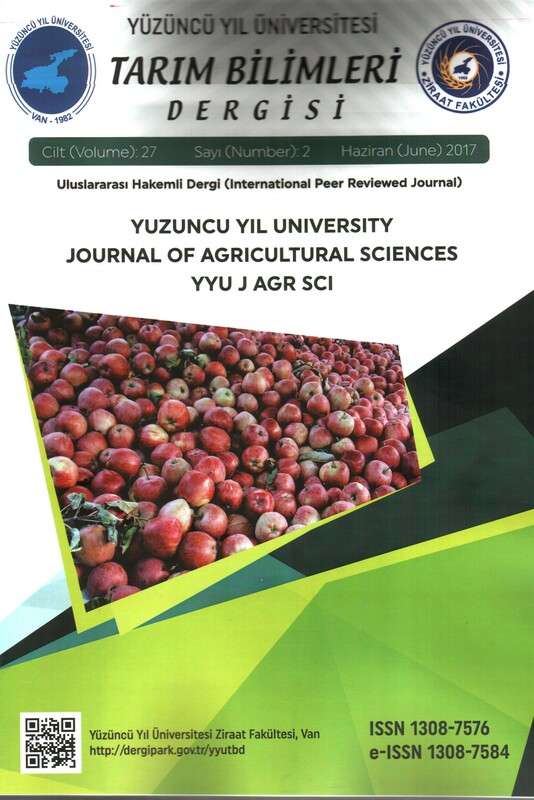 A short review of the fruit germplasm resources of Turkey. Genetic Resources Crop Evolution, Vol. 51: 419-435. Ercisli S, Orhan E (2007). Chemical composition of white (Morus alba), red (Morus rubra) and black (Morus nigra) mulberry fruits. Food Chemistry, 103(4): 1380-1384. Ghosh MK, Kar R, Dutta SK, Ghosh PK, Nirmal KS (2015). Nitrogen harvest index and biological yield for screening of beter genotypes in mulberry (Morus spp. ), Bioscience Discovery, 6(2); 102-105. Goyal SK, Tenguria RK, Saxena RC (2003). Nutritional management of Morus alba for good quality cocoon production, Int. J. Chem. Sci., 1(4); 440-445. Hızalan E, Ünal E (1966). Topraklarda Önemli Analizler. Ank. Üniv. Zir. Fak. Yayın no: 278. Kacar B (1972). Bitki ve Toprağın Kimyasal Analizleri II. Ankara Üniv. Ziraat Fak. Yayınları:453. Uygulama Kılavuzu:155. Ankara. Kacar B, İnal A (2008). Bitki analizleri, Cilt 1., Nobel yayını, 892 s, Ankara. Kar R, Ghosh MK, Majumder SK, Nirmal KS (2014). Induction of DRIS for foliar diagnosis of cationic micronutrients for mulberry (Morus sp.) growing under plains of West Bengal, Nature and Science 12(4): 101-105. Lindsay WL, Norvell WA (1978). Development of a DTPA soil test for zinc, iron, manganese, and copper. Soil Science Society of America Journal 42: 421-428. Mousavi SR (2011). Zinc in Crop Production and Interaction with Phosphorus. Australian Journal of Basic and Applied Sciences, 5(9): 1503-1509. Nelson DW, Sommers LE (1996). Total carbon, organic carbon, and organic matter. p. 961-1010. In D.L Sparks et al. (eds.) Methods of soil analysis. Part 3. Chemical Methods. SSSA Book Series No. 5, SSSA and ASA, Madison, WI. Olsen SR, Sommers LE (1982). Phosphorus Methods of Soil Analysis Part 2. Chemical and Microbiological Properties Second Edition. Agronomy No:9. p: 403-427. Perry E, Hickman GW (2001). A survey to determine the leaf nitrogen concentrations of 25 landscape three species, Journal of Arboriculture, 27(3): 152-159. Sağlam MT (1994). Toprak ve Suyun Kimyasal Analiz Yöntemleri. Trakya Üni. Tekirdağ Ziraat Fak. Yayın No; 189. Yardımcı Ders Kitabı No: 5. Summer ME, Miller W P (1996). Cation exchange capacity and exchange coefficient. In. Methods of soil analysis. Sparks, D. L. (Ed). SSSSA Book Series 5: 1205- 1230. Timmer VR, Teng Y (1990). Phosphorus-induced micronutrient disorders in hybrid popular. Responses to zinc and copper in greenhouse culture. Plant and Soil, 126(1): 31-39. Wang HX, Wu JL, Zhang TJ, Wu OX, Chen Y, Bian JS, Shaan F (1990). Study on interaction between P and Zn and their influence on the growth of maize seedlings in calcareous soils. Acta Pedologica Sinica, 27(3): 241-249.